Stigmata was co-produced by Truant and The Drill Hall with support from Arts Council England. It was performed at The Drill Hall, London in the summer and autumn of 2006, and The Unity Theatre, Liverpool as part of Homotopia. It was directed by Natalie Wilson and written by Billy Cowan. The frst production starred Frog Stone, Declan Harvey, and Malcolm James. The second production starred Frog Stone, Samuel Metcalfe, Sally Armstrong and Malcolm James. "When exposing the church’s gay taboos and lampooning the establishment, you really have to think your attack out with care, especially if it’s in the form of a farce. 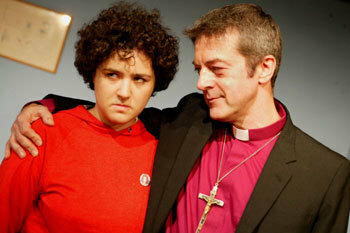 Stigmata’s creator, Billy Cowan, has taken the task by its broad shoulders ...The audience cracked with laughter." Would you lie and make false claims to change something about the world you don't like? Would you hammer nails into your hands and pretend to receive messages from Christ? A young, radical dyke might. "Cowan cranks up an infectious comedy momentum that’s hard to resist."